Located in central Alaska, 240km (150mi) NE of Fairbanks, Alaska. Located in Circle Mining District (4th largest placer gold district in Alaska), on ridge drained by historic and active placer gold producing streams. Good road access via Steese Highway all weather road, & Portage Ck Road. Nearby infrastructure, including airstrip, food, lodging, fuel, & telephone. 11 drill holes completed; intersected sheeted gold-bearing qtz veins. Granite-hosted & schist-hosted sheeted qtz veins. Grab rock samples with gold values of 1 oz/ton; high arsenic, lead, bismuth. Structural corridor with potential for large-scale hydrothermal system. State of AK Upland Mining Lease & claims all in good standing. Mulit-year exploration permit approved through 2012. Tintina Gold Belt, Alaska, USA. The Victory Ridge Gold property consists of 1,162 acres (470.25 hectares), including a State of Alaska Upland Mining Lease (962 acres) and 5 adjoining State of Alaska mining claims (200 acres), all with clear title, in good standing and controlled by Spectrum Resources Inc. The Upland Mining Lease is a renewable mineral lease which extends through the year 2017. There are no political, financial or environmental encumbrances. The area has a long placer gold mining history (since 1893) and local residents are very supportive of mining. The property lies in the Tintina Gold Belt, a regional gold province straddling central Alaska and Yukon Territory, and is located approximately 6 km south of the Tintina fault zone, a major terrane-bounding fault zone. Gold mineralization on the property is associated with the Two Bit pluton, which underlies the southern portion of the property. The Two Bit pluton is a 90 ma pluton ranging from monzogranite to granodiorite in composition, similar to other Tombstone Suite plutons in the gold belt. The northern portion of the property consists of a ridge underlain by hornfelsed quartzite, pelitic schist and local mafic schist. Aplite and pegmatite dikes are common in the hornfels, and some are transitional to arsenopyrite-quartz veins containing anomalous gold values. The main ridge transecting the property is thought to form a roof zone overlying the Two Bit pluton. The area is also cut by numerous Paleogene northeast-trending faults and mafic dikes. This strong northeast structural grain overprints an earlier northwest-trending structural grain, which controls some of the gold mineralization. A similar sequence of mineralization and structural events is found at several gold prospects in the Fairbanks Mining District. Gold mineralization on the property occurs as auriferous, low sulfide, sheeted quartz veins and stockwork veinlets. Quartz-sericite alteration is widespread and locally pervasive in shear zones. Silicification is also locally pervasive in zones containing abundant quartz veins. Several stages of veining are present including: 1) main stage gold-sulfide-quartz veins, which are slightly deformed, and 2) late stage drusy quartz veinlets containing trace sulfides. Granite-hosted veins rarely exceed 5cm in thickness, whereas schist-hosted veins locally reach 1m in thickness. A strong gold-arsenic soil anomaly covers a large portion of Victory Ridge. 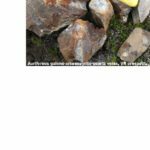 Gold-anomalous rock samples have been collected at numerous locations on the property. Thus far, significant gold mineralization is documented at three prospects, including the VR, Vetter and Crazy Eight prospects. Similar geologic settings and mineralization styles occur on Wishbone Hill, which occupies the western portion of the property. 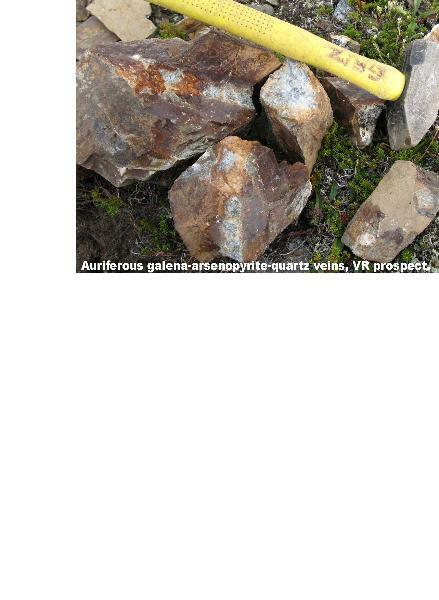 At the VR Prospect, cm-scale, sheeted, auriferous galena-pyrite-arsenopyrite quartz veins, with trace chalcopyrite, are hosted in hornfelsed biotite-quartz schist and quartzite. An electron microprobe analysis from the prospect indicates rims and micro-veinlets of galena on arsenopyrite grains, suggesting late galena formation, possibly during a later hydrothermal event. The galena contains anomalous antimony and trace gold and bismuth. Gold also occurs as discrete micro-inclusions in arsenopyrite and quartz. These mineral associations are confirmed by rock sample geochemistry indicating an association of high gold values with highly anomalous silver, arsenic, bismuth, lead and antimony values. Gold values for vein samples ranged up to 0.9 oz/ton, and metallic screen analyses confirm the presence of coarse gold, ranging up to 7.7 oz/ton in the coarse (+150mesh) fraction. Four drill holes have been completed which intersected sheeted quartz vein mineralization at depth and along strike from the prospect. The veins are situated peripheral to a major fault breccia zone. At the Vetter Prospect, gold mineralization occurs as sheeted, auriferous galena-pyrite-arsenopyrite-sphalerite quartz veins, veinlets and stockworks hosted in granodiorite. The veins occur primarily in sericite-altered, and locally chlorite-altered, shear zones. Intense oxidation in the form of iron or manganese oxides is found locally. Shear fabrics range from strong to weak, and are dominantly oriented northwest, although north and northeast-trending structures and fabrics are found locally. Most structures are sub-vertical or dipping steeply westward, and a few dip moderately eastward. Trenching at the prospect identified several altered shear zones containing anomalous gold. The Vetter Zone (the discovery zone) is a relatively narrow high grade zone which contains visible gold in highly oxidized quartz veins. Panning of crushed material from this zone consistently yields abundant ''colors'' (specks & flakes of visible gold). High grade rock grab samples from the zone returned gold values up to 36.11 g/tonne. To the east, another shear zone returned 0.658 g/tonne over a width of 1.5m, and further east another shear zone returned 1.05 g/tonne over a width of 11m. Six drill holes have been drilled at the prospect, although two were abandoned at shallow depths. One core hole and 2 RVC drill holes intersected multiple zones of shear-hosted gold mineralization with nominal grades. Metallic sieve results of both surface rock samples and drill core samples confirmed the presence of coarse gold. Gold mineralization at the Crazy Eight Prospect occurs as auriferous arsenopyrite-quartz veins and veinlets adjacent to small, sericite-altered granite, aplite and pegmatite dikes intruding hornfelsed schist and quartzite. Some arsenopyrite forms crystalline ‘blooms’ in fractures adjacent to the veins. Rock samples returned gold values up to 1.21 g/tonne, with highly anomalous lead, arsenic and antimony. 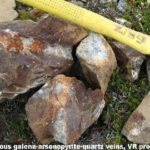 Rubble of gossanous quartz vein breccia just south of the prospect returned gold values up to 0.153 g/tonne, silver values up to 2.2 oz/t, bismuth values up to 307 ppm, arsenic values up to 3,440 ppm, lead values up to 11.75%, antimony values up to 33 ppm, and copper values up to 714 ppm. Rubble of altered granite also just south of the prospect returned gold values up 0.55 ppm along with highly anomalous silver, arsenic, tellurium, antimony, zinc and tin. Soil samples from just east of the prospect returned gold values up to 0.31ppm gold, with highly anomalous arsenic and lead. A vertical core hole was attempted near the prospect, but was abandoned at a depth of 64ft due to a water shortage. The recovered core contains a few narrow sulfide-quartz veins, but has not been analyzed. Several vein prospects occur on Wishbone Hill, but only limited rock sampling has been completed. The geologic setting is very similar to Victory Ridge (ie, the hill forms a roof zone overlying the north portion of the Two Bit pluton), and the mineralization style is the same. 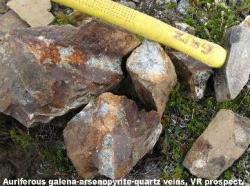 The veins contain galena-arsenopyrite-pyrite and have returned gold values up to 0.64 g/tonne and highly anomalous arsenic. The age and petrology of the Two Bit pluton are similar to the age and petrology of several plutons in the Tintina Gold Belt associated with gold mineralization (ie, IRG's or ''Intrusive-related Gold'' deposits). These 'gold-favorable' plutons are 88-92ma, calc-alkalic to sub-alkalic and granite-granodiorite in composition, and have coarse-grained, porphyritic to megacrystic textures. Prime examples include the Ft. Knox gold deposit in the Fairbanks Mining District, and the Brewery Ck and Dublin Gulch gold deposits in the Yukon Territory. Granite-hosted, gold-bearing sulfide-quartz veins at the Vetter Prospect resemble gold mineralization at these deposits, ie, sheeted style sulfide-quartz veins peripheral to shear zones. Northwest-trending shears at the Vetter Prospect are thought to be related to a suspected large-scale structural corridor or fault zone on the Victory Ridge Property. A large scale geochemical zonation is also suspected, consisting of proximal gold-lead-zinc associated with intrusive-hosted mineralization (Vetter Prospect), and distal gold-lead-arsenic-antimony associated with schist/quartzite-hosted mineralization (VR Prospect). Rubble of sulfide-quartz vein material occurs at numerous locations on Victory Ridge and Wishbone Hill. Mineralized pegmatites and altered granite on Victory Ridge (Crazy Eight Prospect) could suggest mineralized granite (like that found at the Vetter Prospect) underlies the ridge. Systematic grid-based soil sampling over most of the property. Samples should be analyzed for gold plus a multi-element ICP package. Trenching at the VR, Vetter, and Crazy Eight prospects, and possibly other targets delineated by soil sampling. Trench floors should be mapped in detail and systematic rock chip channel sampling should be completed. Samples should be analyzed for gold plus a multi-element ICP package. Property-wide geologic mapping, prospecting and rock grab sampling. Ground magnetic and radiometric surveys along north-south lines to identify lithology, structural, mineralization and alteration trends.